I studied as both an undergraduate and graduate student at Essex – graduating with my PhD (ESRC) in Sociology in 2004. My research was with mothers and fathers who have children identified with ‘special educational needs’, which I subsequently published as a monograph for Palgrave in 2007 under the title of Parenting and Inclusive Education. I then secured an ESRC post-doctoral fellowship at Cambridge University in 2004. Since leaving Essex, I went on to lecture at Keele and Brunel before moving to Anglia Ruskin as a director of PhD research and the Childhood and Youth Research Institute. I joined Aston Sociology in September 2012. I have continued to publish in the areas of mothering, disability and the sociology of education, but have also moved on to more theoretical research in the area of, for example, Being Human and ‘Inclusion’ and am currently writing a book entitled Intellectual Disability and Social Theory: Philosophical and Sociological Debates on Being Human for Routledge. I have also followed up on research within the area of relationships and intellectual disability and completed a qualitative pilot with young disabled people on discussing their relationships, friendships and leisure time, with Dr Tam Sanger. More recently still, I co-edited a book, Critical Approaches to Care: understanding caring relations, identities and cultures, with Dr Susie Weller, and am interested in continuing to follow up research within a care ethics discourse. I have also published research papers in, for example, Sexualities, British Journal of Sociology of Education, Disability and Society and International Journal or Inclusive Education. I remain passionate about intellectual disability research and social justice from a sociological perspective and a personal position. Essex has had such a massive impact upon my life from making lifelong friends to meeting my husband and it spans from 1992-2005 (I did venture out for four years into the world of full time work after my MA, but came back for my PhD research). So many people had an influence on my life, both socially and academically. Unfortunately some are no longer with us, such as David Ford who spent many an evening with Gary Potter, Jose Lopez, Oonagh Corrigan, myself and others putting the world to rights – dodgy photos withheld! Of course it always started that way after a seminar or such like, but by the time we were under the podia and rather drunk our conversations may well be left just there – under the podia! Ian Craib on the other hand was there for academic encouragement as my BA and MA dissertation supervisor. He once said to me when I asked him about becoming a drama therapist, ‘Chrissie you seem happy enough, doing therapy will open up a can of worms that are sometimes best left in the can’. Needless to say I did not continue down that path, but his silences in supervision clearly worked for me. He may no longer be with us, but his reflections are alive and well and certain quotations of his will never die in my work. That reflection was largely about the MA days. But really my journey began in 1992 when Nigel South interviewed me for a place. I was sitting in the reading room waiting for my turn and one student walked past crying. ‘I said what’s wrong?’ she replied saying ‘I was asked about what’s going on in the news! – I didn’t know’. At that point I thought ‘okay I’m leading this interview’. Needless to say Nigel and I had a great conversation about my voluntary work at a young offenders unit! The autumn came and my bright eyed and bushy tailed ‘mature student’ – I was 24 so not very mature really – lone parent self arrived at Essex to Ken Plummer and his theatrical way of delivering sociology. I was hooked and embraced academia in every way possible, from loving every minute of engaging with sociology (except for SPSS in the second year! ), being blown away when in an Enlightenment lecturer Joe Allard played the grand piano – I was mesmerised – and joining TAS (Theatre Arts Society). My early memories of making lifelong friends began in a seminar in my second year. Vanessa Longley and I had a row in the seminar about social class (well more of a debate really, but she infuriated me and I her) much to the bemusement of Carlo Ruzza who was trying to take control of the situation. But we had a chat in the reading room after that and our assumptions of each other were torn away. We went on to share a house for a year in her third year and my MA year. She is still one of my very few closest friends. We too had our connection in the fact that John Scott introduced us to his daughter, who at the time was still wondering about what degree to pursue. Susie Scott of course was clearly a budding sociologist before maybe she knew! In our introductions then to Susie, Vanessa was calm and measured; I was simply loud and let’s say less calm. We hoped that the combination worked and that at the very least I wouldn’t scare her in any way: clearly I didn’t: much. My undergraduate days were full of drama – quite literally treading the boards (mostly with Kerry Stagg a Literature student another close lifelong friend – who by the way was introduced, by me, down in the SU bar as I sung a rendition of ‘I will survive’ to her, rather inebriated), juggling my family life and soaking up sociology. My MA year was a lot quieter and riddled with relationship crises, and daughter and her education issues and hard work. Still I maintained my sociological sense of self and left Essex to pursue work as a support worker in London. In that period away from Essex I travelled round the world (in part) with my then 10 year old daughter on my own, and a year later shaved my head bald (much to my daughter’s dismay) and cycled from Jaipur to Agra for charity! By 2000 though clearly it was time to come back to Essex and I was very fortunate to gain an ESRC PhD grant (after starting part time) for full time study. At this time those I met during my MA who were PhDs were finishing up and I began that research journey. I made good use of all those activities such as the graduate conference and Rowena was then well established and always was there to organise the fun and frivolity at times like these. I lost the time to tread the boards, but loved the research and academic buzz that this was enough. My PhD supervisor Pam Cox had two babies during my time, but still we got the PhD ‘baby’ out in just under four years! Along the way relationships came and went but along with the friendships that stayed (aside from those mentioned) were particularly with Catherine Theodosius, Catherine Will and Eamonn Carrabine. Eamonn used to hang out with some of us along with a few of the other academic staff and was a friend for three years before we became an item. We were married in 2005! Even since leaving, Sociology at Essex brings people together as I have become friends with other Essex ex-PhD students and am enjoying social times with Liz Carter and the crew! 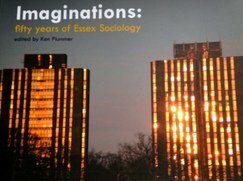 There are of course so many more people who have influenced my Essex journey and I can honestly say Essex Sociology has given me more than a sociological imagination!! I started studying at Essex in 1996 and after completing both my BA and MA I am still here. 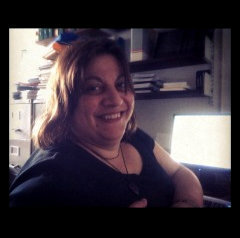 During my MA, I began working as the editorial administrator with Ken Plummer on the journal Sexualities. Subsequently I also became the editorial administrator for European Societies with the former editor John Scott and now with Göran Therborn. I still enjoy immensely my work on the journals. Both my dissertations focussed on the topic of domestic violence within the Greek Cypriot community in London. My interest in the topic of domestic violence led to my active involvement in the local refuge. I was also a research assistant on a nationwide project in partnership with The University of Warwick. The project ‘Talking to my Mum’ which explored the relationship of mothers and children who had suffered abuse. I enjoy participating in different projects which interest me, one being the up and coming 50th anniversary of the department. I also enjoy organising conferences and workshops. The last conference which I was involved in was The Dennis Marsden Memorial conference.